There's nothing especially difficult about making rye bread at home. I'm fairly new to making rye bread, so this is a page which will grow as I discover more recipes and techniques. Bread machines are of course useful for making rye - or any other bread - but by no means essential. If you use a bread maker a lot it may earn its space in the kitchen - otherwise it is just more clutter! Mixing rye bread and other types of bread by hand is part of the fun - in my view, at least! Rye flour is relatively dense and low in gluten, so it is very often mixed with a proportion of wheat flour to ensure that it rises properly. Other than that, using rye is just like using any other flour. For more on the characteristics and nutritional value of rye flour see this page. 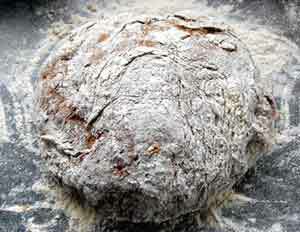 For complete (and painless) instructions on how to bake successful bread, click here. This inexpensive e-book gives you the whole story! Most of the recipes given here should be easy to adapt to using with a bread making machine though I cannot claim to have tried, as yet. Bread makers are great but they take up valuable space, so when my old one broke I didn't replace it. So far, I haven't regretted its loss. Making bread by hand is fun and not really all that time consuming. The key is good timing and preparation. There is a huge range of rye bread recipes to explore, from Jewish rye bread with the traditional caraway flavouring, to rye soda bread. Rye bread can be quite delicious and it's certainly nutritious so it's a good natural food to make at home. If you want to be a little greener and healthier, use organic rye flour. It is easy to come by - most health food merchants (including Holland and Barrett in the UK) stock it. 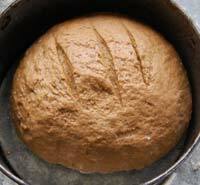 Here are some very easy recipes I use when making rye bread. This recipe is really straightforward. You can even use volumes rather than weights if you prefer - just measure in pints or litres or cups. Sieve together equal quantities of strong white flour and rye flour and a good teaspoonful of sea salt. Add 2 tablespoons of molasses or malt to 1/2 pint of warm water (mix boiled water and filtered cold water together to get water which is tepid). Add two teaspoonfuls of dried yeast and leave the mixture to bubble up for about 15 minutes. Put a dip in the centre of the flour and add the molasses or malt mix and add 2 tablespoonfuls of vegetable oil. Work the fluid into the flour gradually. You should get a dough mix which is slightly sticky but not sticky enough to actually stick to your fingers once everything is well mixed. Now knead the mixture thoroughly for a good five to ten minutes, so that the dough becomes more elastic feeling. Set the dough to rise in a warm place for 1 - 2 hours - long enough that it doubles in size. Knock the dough down with your fists. Divide your dough into two loaves and shape them as you like. I find they cook a little more evenly in a bread tin. Let the covered dough rise again until the it is again twice the size. Pop the loaves into a medium oven (gas mark 6) and bake them for around 40 minutes. You may want to take them out and turn them over after about half an hour, so that the bottom cooks properly. Turn the oven down a notch at this point. This recipe gives loaves which are slightly sweet with a good texture - not too dense. If you want an even sweeter result add a little more molasses or malt. You can also add caraway seeds to the mix before kneading. Another good variation is to add a little cocoa powder - about 1 tablespoonful. Rye flour mix ready for adding the yeast. It's easier to do if you make a well in the centre of the flour first - less messy! 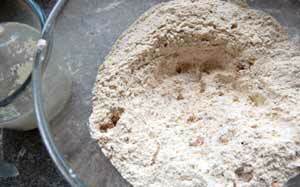 Use a fork to work the liquid into the rye flour, then work the mixture with your hands until it is all one mass. Rye flour dough ready for kneading. Rye flour dough ready for the first rise. Rye bread ready to eat. This one is a sourdough one with a very little added malt. 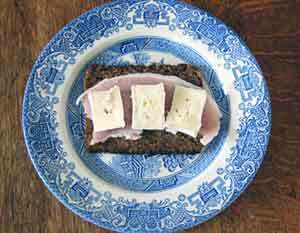 Rye bread can be served with cheese, meat or both - any way you would serve wheat bread. This picture shows pumpernickel, a type of rye bread popular in Germany and elsewhere.